Merseyside Police have discovered a cannabis farm worth more than £1 million per year in Bootle today, Friday 12 January 2018. At around 7.10pm yesterday (Thursday, 11 January), officers were called to a house on Hawthorne Road after reports of squatters in the premises. Officers from the force’s specialist Cannabis Dismantling Team (CDT) attended and made the property safe. A large cannabis farm with 271 plants was found across four floors of the property. The electric supply was found to be have been bridged. Enquiries are ongoing to identify those responsible. Sergeant Gary Sorrell from the CDT said: “The excellent result shows the scale and organisation that some criminal groups are capable of. But more importantly, it demonstrates that we can and do identify such significant farms on a regular basis, taking away the harm and risk that they bring to our communities. “If anyone has seen suspicious activity in or close to the South Park end of Hawthorne Road in recent days, please pass the information on, which may prove vital in tracking down those responsible and bringing them to justice. “Criminals who set up these farms cause considerable misery for hard-working people who just want to earn an honest living, and attract violence including knife and gun crime to those communities in which they operate. Anyone with information on the cultivation of cannabis can call police on 101. You can also call the independent charity Crimestoppers anonymously and for free on 0800 555 111 or via their online form: https://crimestoppers-uk.org/give-information/give-information-online. Merseyside Police can confirm that emergency services are in Southport following a road traffic collision this morning, Thursday, 11 January. At around 10.30am, a call was received of a female pedestrian hit by a lorry on Cambridge Road. The woman has been taken to hospital where she is in a serious condition. The driver stopped at the scene and is helping with enquiries. There are currently road closures in place on Cambridge Road and Manor Road and Preston New Road while enquiries are carried out. Anyone who witnessed the incident is asked to call Roads Policing on 0151 777 5747 or 101 quoting incident number 270 of 11 January. Schoolchildren from Sefton have won a ski trip to Scotland after winning a special competition around the dangers of scrambler bikes. Last night (Tuesday, February 9) Merseyside Police hosted a prize-giving event which rewarded Sefton schoolchildren who have been involved in an anti-scrambler bike education project during the Autumn term in 2017. Early in 2017, Year 5 pupils at the schools received education on the dangers of off-road bikes and impact they cause in their communities. Assemblies have been given to each of the primary schools from Merseyside Police, Sefton Council Anti-Social Behaviour Unit and Alder Hey Hospital. Once the pupils returned to school to begin their Year 6 studies, they each designed and filmed a 90-second video. They have also taken part in a trip to Crosby Lakeside Adventure Centre and an awareness day in the Yorkshire Dales, where demonstrations were given on how to use bikes appropriately at designated locations. 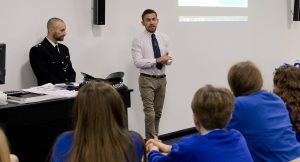 The 15 winners of the video competition were presented their certificates by Andy Grant, former Royal Marine, motivational speaker, athlete and star of ITV show Paragon and Pete Price, DJ from Radio City, before the grand unveiling of the top-secret children’s prize, a ski trip to Scotland. “It is really pleasing to see so many Sefton school pupils being recognised like this through such an important project. “We know that these bikes can cause significant nuisance, stress and danger to members of our communities across Merseyside, and we will continue to stand alongside our partners and communities in our commitment to eradicating the problem. “We strongly believe that education and engagement is vital, so that parents, guardians and future generations understand the impact and harm that we see on a regular basis. Together, we can all make a difference to make our streets safer. From March 1, 2018 landlords who privately rent out their properties will be required to obtain a new licence from Sefton Council if their properties are located within selected areas in the borough. Sefton Council approved the implementation of two new housing licensing schemes in September, 2017 in separate areas of the borough. Both schemes will run until the end of February 2023. Sefton designated an area of Bootle as being subject to Selective licensing, (all privately rented properties) and has designated parts of Seaforth, Waterloo, Brighton-le-Sands and Southport as being subject to Additional licensing. Additional licensing requires all houses defined as a house in multiple occupation (HMO) to apply for a housing licence. Mandatory licensing for larger HMO properties is currently a national requirement. A full list of all streets affected along with further details of the schemes, licensing conditions and fees are available on sefton.gov.uk. Landlords will be required to meet a range of licence conditions, and show that they have appropriate management arrangements in place. If you are a landlord, a person managing a property within the areas of the designation you are advised to check whether your property will require a licence and ensure that you apply for one per property. Cllr Trish Hardy, Sefton Council’s Cabinet Member Communities and Housing, said: “We have areas where many properties currently fail to meet the required homes standard, which can have a terrible impact on the health and welfare of their tenants and their wider communities. “The schemes we have introduced aim to reduce that by making sure private landlords meet satisfactory standards of tenancy and property management. “But it is also about tenants behaving in a way that does not blight or impact on their community and shows respect for their neighbours. Landlords can apply for a reduced fee for either applying within the first 3 months of the scheme, being accredited or when a Sefton accredited managing agent is appointed by the landlord to be the licence holder. Further details of the reduced fees are available on the Council’s website. Further details of Sefton’s property (and managing agent) accreditation schemes are available on www.sefton.gov.uk/housing. Early application for property accreditation is encouraged. Merseyside’s Police Commissioner is inviting bids from charities, third sector and voluntary organisations to deliver four specialist support services for victims of some of the most damaging crimes. The announcement comes after the Commissioner revealed her plans to further improve the Victim Care Merseyside service from 2018 onwards by expanding some of the existing support services and commissioning a number of new services aimed at plugging the gaps created by new and emerging crimes. The Victim Care Merseyside support service for families affected by homicide, including families of crime-related road traffic collisions for £24,000.